After posting a few quick and easy recipes this week, I started receiving emails from my readers letting me know how much they appreciated the quick and easy recipes. I now realize that most of us have one thing in common, we are all looking for a quick and easy homemade meal that does not require us to slave in the kitchen for hours. Fortunately, that’s kinda my style. Although I do love to bake and cook I try to keep everything simple and easy with as few ingredients as possible. I’m one of those type of people that used to think you don’t need a recipe for garlic bread because it’s so god darn easy. After a few bad incidents, I stand corrected, order to make really good garlic bread you need to have the perfect mixture of butter and olive oil. Adding too much butter can make the bread dry and adding too much oil leaves it soggy. I used a mixture of butter and olive with a ratio of 2:1 butter to olive oil. This recipe is super simple and can be put together in just a few minutes. You basically mix all the ingredients in a small bowl and spread on the bread, then top with cheese and place in the oven for 5-8 minutes. The end result is AMAZING! just imagine the flavors of the garlic and butter mixture, with the gooey cheese, and crunchy bread. This is by far the easiest recipe ever. 1 cup Mexican mozzarella, or Italian cheese blend, grated. Heat oven to 400 degrees. Cut loaf down the middle and place on a peace of foil or pan. In a small bowl mix the softened butter, olive oil, crushed garlic, and parsley. Spread the mixture on the bread. Top with cheese and place in the oven for 5-8 minutes or until the cheese is fully melted. Remove from oven and cut into strips. Serve warm with you favorite dipping sauce. Enjoy! Yes, but I highly recommend fresh garlic. I am going to make this tomorrow!! I am making home made spaghetti sauce (for the first time!!) and I totally forgot to buy anything for garlic bread and the only kind of cheese I have is mexican style!! I was looking all over to see if maybe it would taste okay and with your recipe I shall definitely try it out now 🙂 thanks! This looks heavenly! 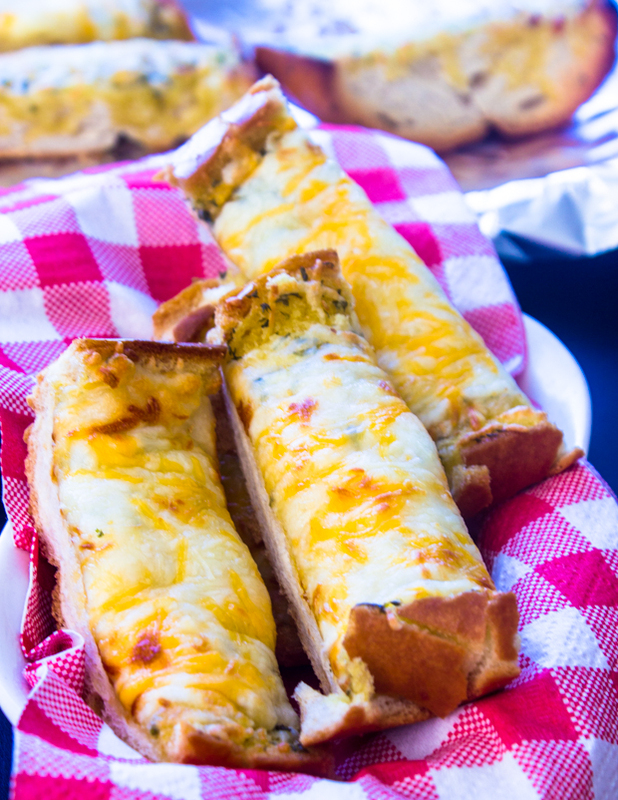 Bread, cheese, garlic – what more could you need?! Delish! Did you also put mozzarella? I made a similar bread this week, grilled cheese on sandwich is becoming my favorite quick fix for dinner. Wow I had no idea about using both butter and olive oil! What a great tip! Love your easy and quick style! The great thing is- you’re recipes don’t sacrifice quality or taste for speed. 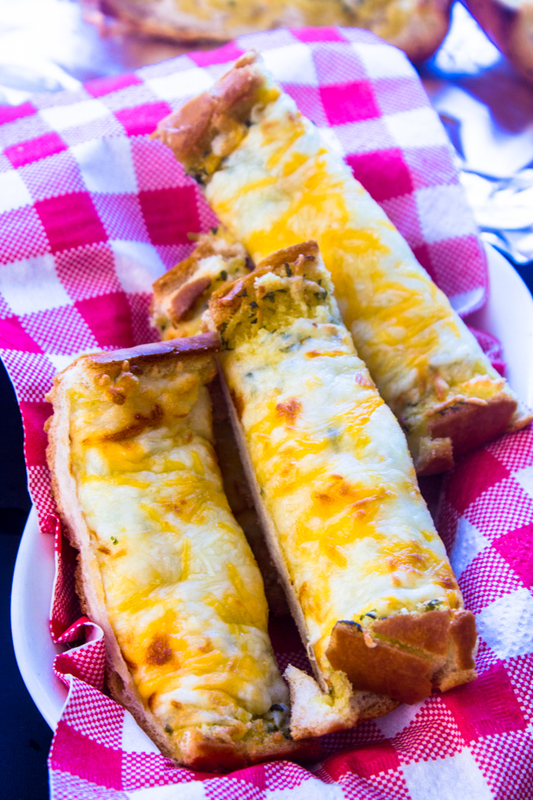 This will be a great recipe to try in my home: my nephews LOVE bread and cheese! A classic…for good reason! Love how your version is the cheesiest I’ve ever seen. I’m drooling! 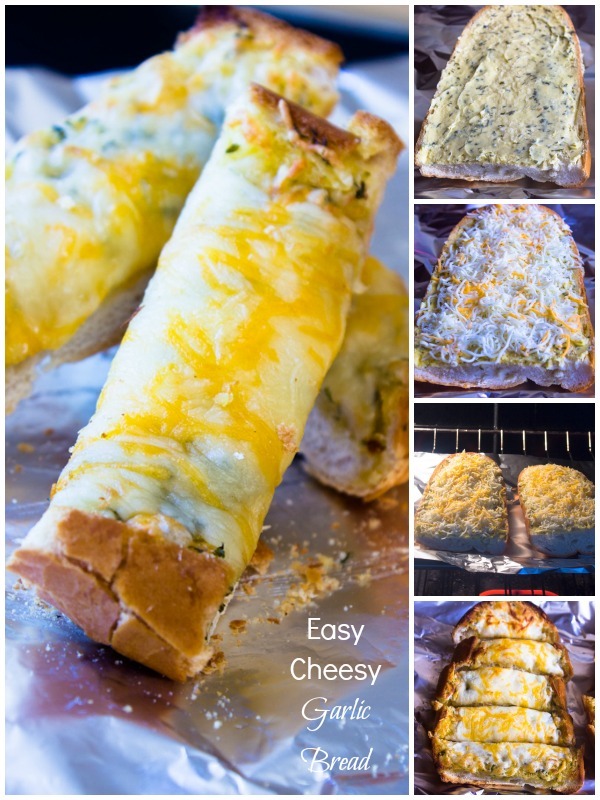 Super simple and cheesy good-I have got to try this! Thanks! I’m glad you like it Adri! Looks so delicious Layla!! And very easy! Love all that cheese! Quick and easy recipes are always great. Thanks for sharing! It certainly looks like the best easiest recipe ever! I mean, look at all that cheese. I really don’t think it gets much better than this!! Oh my! what did you do wrong Nicole! I’ve had my share of bad dishes and the hubby usually takes a few bites and than admits that it was bad lol! There’s nothing better than quick and easy meals in my book! Thank you so much Kelly! aaaand I’m drooling. LOVE this! I’m a huge fan of easy recipes too. 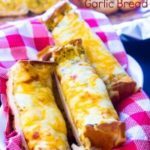 This cheesy garlic bread looks delicious! The cheesier the better! Yes, I’m all about the cheese! Thanks!